The hill sinks down upon the deep. With hardihood against a host. 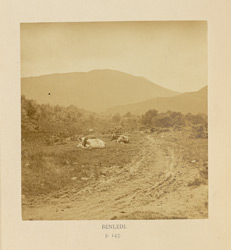 This view of Ben Ledi, a mountain in the Scottish Highlands, is one of 13 evocative landscape photographs by Thomas Ogle illustrating an 1863 edition of Sir Walter Scott’s epic poem ‘The Lady of the Lake’. It accompanies a passage describing the country through which the King of Scotland, James V, travels in disguise as a Saxon knight towards a confrontation with Roderick, a rebel Highland chief of Clan Alpine. Under his leadership, warriors of the clan are mustering throughout the Highlands in readiness to do battle with the King.